Friday I met my "special someone" at Stoney River for their happy hour. I highly recommend it. They have great appetizer and drink specials. After hanging out there for a couple of hours we went to visit my parents. Even though I was stuffed, I couldn't pass up on eating some of the delicious crab legs my mom made. Saturday was such a rainy day that I didn't feel like doing much of anything. I pampered myself with a manicure and hung out with the family again. In the evening, I went to my "specials" house for their monthly family dinner. Saturday night, I was in the bed by 9:30 pm. I haven't done that in a long long long time but it felt great!!!! Even though it was winter like weather out on Sunday, me and the "special" decided to grill some steaks. I invited my Uncle to come over and my mom, dad, brother and niece stopped by as well. 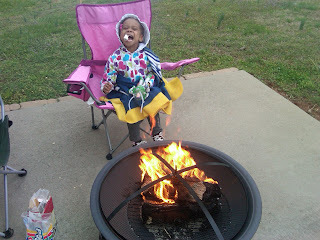 It was a great family day with yummy food....steaks, baked potatoes, salad, rolls, and of course....SMORES. My niece loved it. It was a busy day and we didn't settle down until 7ish, but it was worth it. There is nothing like spending time with family and friends. Now back to the work week.......is it Friday yet?? Yum! Smores are the business. My Grandpa and I make them in the microwave for dessert sometimes. It's not the same, but it works during a Wisconsin winter. @Laura....I just got a fire pit a couple of months ago and I've been using any excuse that I can to light it up. The thing is, I only eat one and then I'm done.